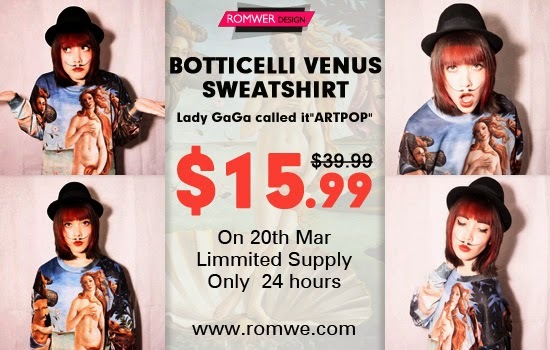 romwe "birth of venus" boticelli sweater sale! Enjoy priceless art anytime you want by purchasing one of the most recognizable paintings in human history, Boticelli's "Birth Of Venus", on a cool sweatshirt for only $15.99/PHP717.00 for 24 hours only! This March 20, 2014, ROMWE's highly covetable Birth Of Venus print sweater will be on sale at more than 50% off plus free shipping worldwide. or visit this LINK to try and get it for FREE! Don't forget to check out the sale HERE within 24 hours! I found a tip many years ago on a shirt pattern for an easier way to put in sleeves : sew your front panels to the back only at the shoulders. Pin the sleeve pieces right sides together to the shoulders, matching ends. Sew the entire underarm and sleeve seam at once. Saves a lot of hassle, especially if the sleeve is gathered. I always put in sleeves this way now, even if the pattern says to do it the old way. This is an excellent way to sew tiny (Barbie) clothes as well. This looks interesting, but I must have missed something. I understand to deconstruct and get stuck. I don't see anything that changes the shape of the pieces. It looks like I'm to deconstruct and then reconstruct without changing anything. Any help here? People seem to be missing the fact that you use the old kimono, deconstructed, as a PATTERN for the new kimono! You are not taking it apart just to put it back together again. Not always comfortable that way. To have full benefit of a set in sleeve, sew only to the front and back notches in the flat. then sew the side seam, the sleeve seam and then sew the balance of the sleeve into the amscye between the notches. Perfect sleeves every time. I've sewn my set in sleeves that way for 50 plus years. Why don't you deconstruct your old Kimono, buy a roll of fabric tracing paper or a roll of white paper at Staples. Trace the old kimono on to the paper and then you have a paper pattern to use any time. Sew your old kimono back together. Then you can have more than one kimono, plus your fav old one to wear. I dont have a kimono to deconstruct! So?? ?